The politics of single-payer health care continue to roil California, as progressives push for implementation of the furthest-reaching health care overhaul by any single state while moderate Democrats worry about cost and implementation. California's Assembly Speaker Anthony Rendon on Monday pocketed "a controversial single-payer health care bill that would dramatically reshape the state's health care financing and delivery system," according to the Sacramento Bee. 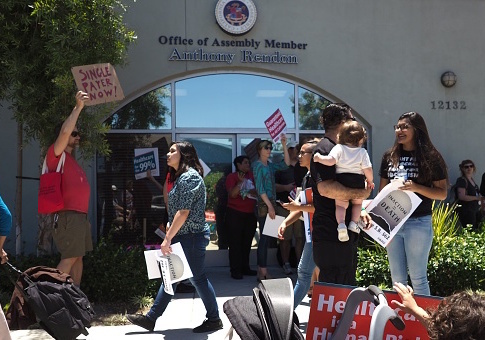 As an alternative, a group of lawmakers from the Assembly's lower chamber have unveiled a package of 14 bills meant to address health care issues in a piecemeal fashion, tackling items as diverse as how to offer coverage to undocumented immigrants; creating financial assistance for low-income citizens who may be struggling with high premiums, deductibles, or other out-of pocket costs; and a possible requirement that would mandate a ratio between spending on patient care versus the company's profits. Whether or not he intended the move to do so, Rendon's actions could put the spotlight back on the moderate-versus-progressive debate between two of the top Democrats vying to be the state's next governor. The Bee said single-payer has become "a litmus test in the minds of progressive activists in the Democratic Party." Earlier in March, Antonio Villaraigosa challenged the presumed gubernatorial front-runner, Lt. Gov. Gavin Newsom, to a one-on-one debate only on the topic of single payer. Both are Democrats. Villaraigosa, the former Los Angeles Mayor, has been vocal in his criticisms of single-payer, at least from a financing angle, saying last year that politicians who are pushing a single-payer system without identifying how it will be funded "are trying to sell you snake oil." "If you're looking for snake oil, I'm not your guy," he said. The package of 14 bills that will apparently get a hearing in the California Assembly this year still faces questions about the price tag. "As is often the case with aspirational bills like these, it's not clear yet where the money would come from to pay for them," Larry Levitt, a health economist at the Kaiser Family Foundation, was quoted as saying by the Bee. "Figuring out how to finance the increased coverage and subsidies could prove controversial." Even when the health care debate isn't about the governor's race, there have been dramatic moments of intra-party political accusations. When the California Senate passed a single-payer bill last year, Rendon was critical of the motives. "It seemed like a stunt to me," Rendon said. "It seemed to be an entirely symbolic piece of legislation and I didn't think it had any place in a serious discussion about health care." The battle over single payer has a lengthy history in California. The Assembly passed single-payer bills in 2006 and 2008 only to have both of them vetoed by then-governor Arnold Schwarzenegger. This entry was posted in Issues and tagged California, Health Care. Bookmark the permalink.